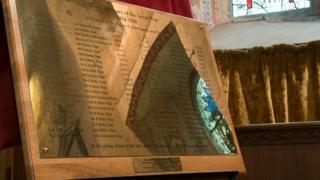 A plaque commemorating soldiers who died during the Battle of Loos in France has been unveiled in a Berkshire village. The plaque names the 44 soldiers from Aldermaston who died while serving in the 8th Royal Berkshire Regiment. Children from Aldermaston CE Primary School have handwritten the names, which have been engraved onto the plaque at St Mary's Church . It has been created to mark 100 years since the battle. The new memorial, commissioned by The Atomic Weapons Establishment (AWE), includes 16 extra names. Research for the centenary plaque revealed soldiers from the village, including several sets of brothers, had not yet been remembered. The battle, which began on 25 September, was part of an attempt by the French to break through German defences in northern France. About 250 soldiers from the regiment who fought at the battle in France in 1915 were killed, and more than 700 were injured. During the battle there were 50,000 British casualties.